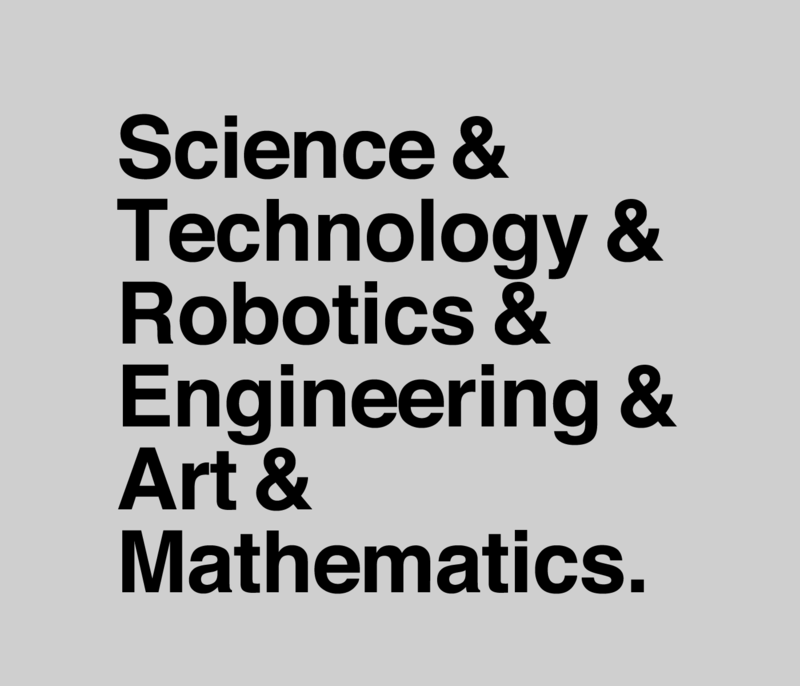 I love the Evil Mad Scientist STEAM T-shirt but I thought there was something missing, so I changed it to STREAM because… Robots. Remember to stream big, my friends! Heads up, kids! I’ll be at Maker Faire Detroit on July 27th & 28th, 2013, mainly to take part in the Power Racing Series, but I’m sure I’ll find time to check out the faire as well. Milwaukee’s Team will be represented by great new crew this time around, including Audrey, Tony, and Chris, as well as Sean (our veteran) and myself. We’re hoping to bring 3 cars to the race… well, 3 working cars, hopefully. We’ll probably return with no working cars. Special thanks to Mike Massie who worked on the racing team logo. He got it about 95% of the way there, and I supplied the last 5% (mainly by messing with the files he gave me.) 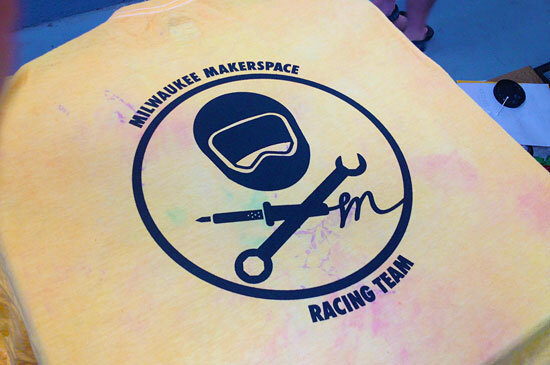 So this year our team will have spiffy shirts, and to make them even more obnoxious moxilicious noticeable, I’ve dyed them all sorts of crazy colors. You should be able to find us. Anyway, join us at Maker Faire Detroit on Saturday and Sunday at 1:00pm for the races. It’s pretty entertaining. There will probably be fire. 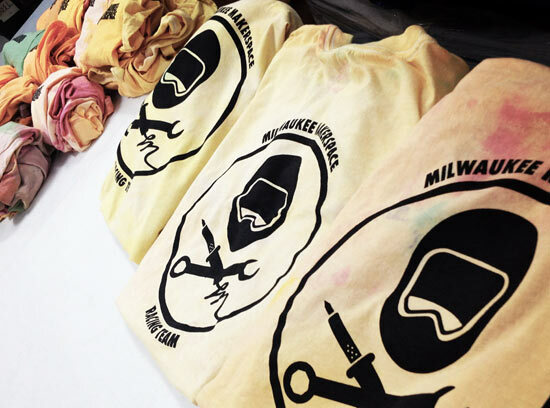 Hey, we printed some shirts at Milwaukee Makerspace! There’s a nice 4-color screen printing machine at the space, and it’s been sitting in the back hallway neglected, and since I used to do screen printing full time (and as a hobby) I figured I’d get it cleaned up and use it. I used a (slightly) modified version of the helmet from the standard logo, and opted not to include the wrench and soldering iron due to the fine details they have, which is a lot harder to do with vinyl. 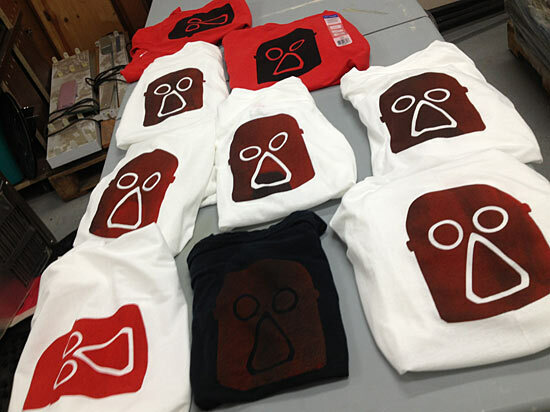 We started with red ink on white shirts, and slowly added black ink to get some one-of-a-kind prints. Eventually the ink gets darker. 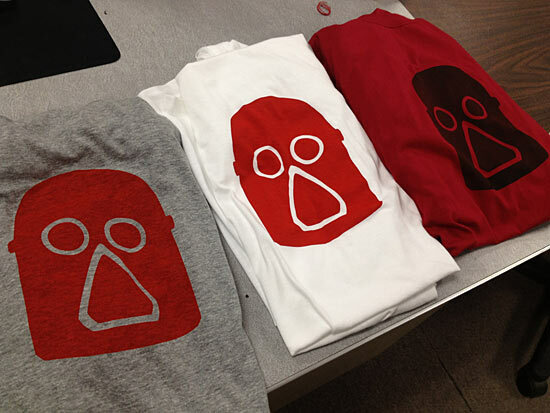 Once it was black we started printing some red shirts as well. We also did a black shirt for Audrey. I suggested doing a print-dry-print process, but she really liked the subtle look of a single print. We probably printed 25 shirts, which we wore in the South Shore Frolics Parade so we at least looked like some sort of real group instead of a bunch of crazy weirdos riding on children’s toys… oh wait. And when I say “we” I mean that I showed others how to screen print, and a few people printed their own shirts. I also talked through the process, which was cool, as it’s been a while since I shared it with others. I’ll be doing more screen printing at the space in the future, like next week probably. 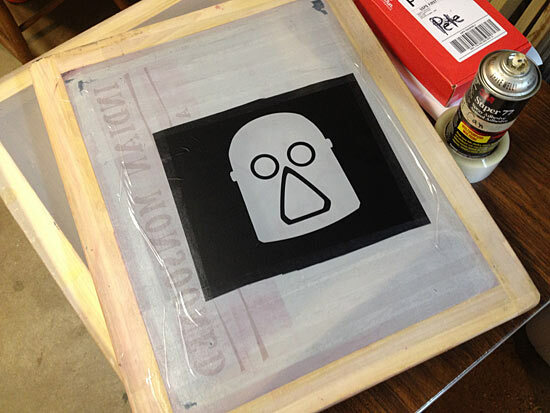 If you need help with a screen printing project, let me know. 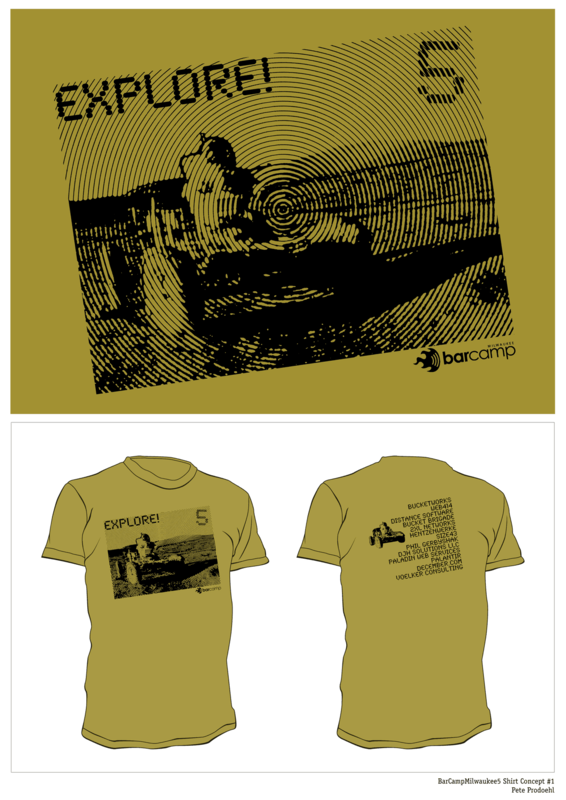 Submitted for your approval… My design concept for the BarCampMilwaukee5 t-shirt. The title is “EXPLORE!” and it’s got an astronaut driving a land rover on the Earth’s Moon. 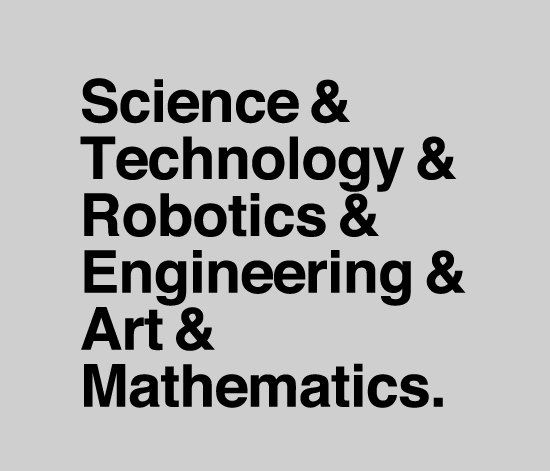 Our old E-Pal HeyGabe got appointed the T-shirt Czar, and with that he put out the call for t-shirt designs, and I have heeded the call, and the results are below. 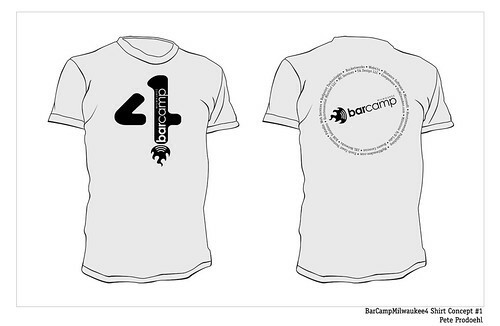 This is a number 4 blasting off into space by the power of BarCamp! This is a robot based on an original drawing by Madeline Prodoehl. People seem to like robots. 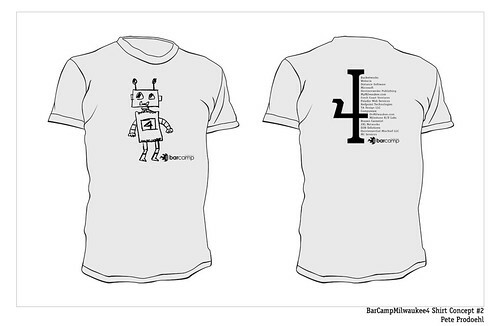 Keep in mind, HeyGabe is the T-shirt Czar, which, I believe, means that he has the power to choose what shirt design is selected. I mean, maybe you can influence him, but don’t quote me on that.